More and more antique enthusiasts are turning to Borneo Artifact, a leading and trusted antique gallery based in Malaysia for exceptional and engaging pieces for home décor. freePRnow.com, 11/08/2018 - Malaysia, (November 08, 2018) – The influence of antiques in the direction of taking home décor to the very next level is indisputable. However, accessing authentic cultural / tribal art and antiques at justifiable prices still poses as an obstacle for everyday enthusiasts. With Borneo Artifact the leading Asian Online Antique Gallery extending its shipping policies to all major locations around the world, this otherwise nagging issue appears to have dissolved completely. Borneo Artifact is one of the leading and most trusted Asian Vintage Art Galleries based in Sarawak, Malaysia. With over 25 years of experience in dealing with unquestionably authentic art and antiques, the gallery has risen to become a one stop solution for all interior and outdoor décor requirements. Borneo Artifact presently hosts a very extensive catalogue that includes an array of Indonesia Antiques, Borneo cultural art, Malaysian vintage artifacts and more that cater to the preferences of new enthusiasts and seasoned collectors alike. Tribal statues, wooden sculptures, masks, art pieces and totem poles have been ranked as best sellers by Borneo Artifact over the past few years. Comprehensive shipping policies and infallible customer support has further contributed to winning and maintaining trust of clients. 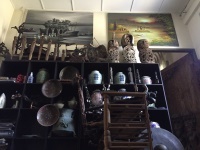 Borneo Artifact is a trusted Vintage Asian Antique Gallery that has over 25 years of experience in dealing with very high-quality authentic art and artifacts from Borneo. Their catalogue is extensive and currently stretches to cover 29 different categories. The gallery has comprehensive shipping policies that are applicable to all global clients at individual and commercial levels.